Hi all, it's about time that we gave some more information on how to get a camera enabled Marty working. We also need to explain more about what ROS is, and why its so awesome. This is the first part of a short series of posts I'll be making, hopefully each weekend. I'll try and keep things as simple as I can, but to get the most from this you should have some knowledge of Python, and be comfortable typing stuff into a terminal. I've tried to explain the gist of what's happening in each step, but there are some topics here that could (and do!) have entire books written about them. We'll go into more detail on some of the aspects in the future. At the end, we'll have a Marty that can react when shown a ball, and actually walk to it! Youtube video - Marty walking to the ball! A way to mount the camera on Marty - for example using our 3D printable camera mount, or just some blu-tac or tape. Note :- if you've got an old version of the Raspberry Pi image, you should be able to just update the code rather than downloading a whole new image. In each repo (e.g. ~/marty_ws/src/marty_football), do git checkout dev and git pull origin dev. If in doubt, it's easier to just download the image and flash a new SD card. 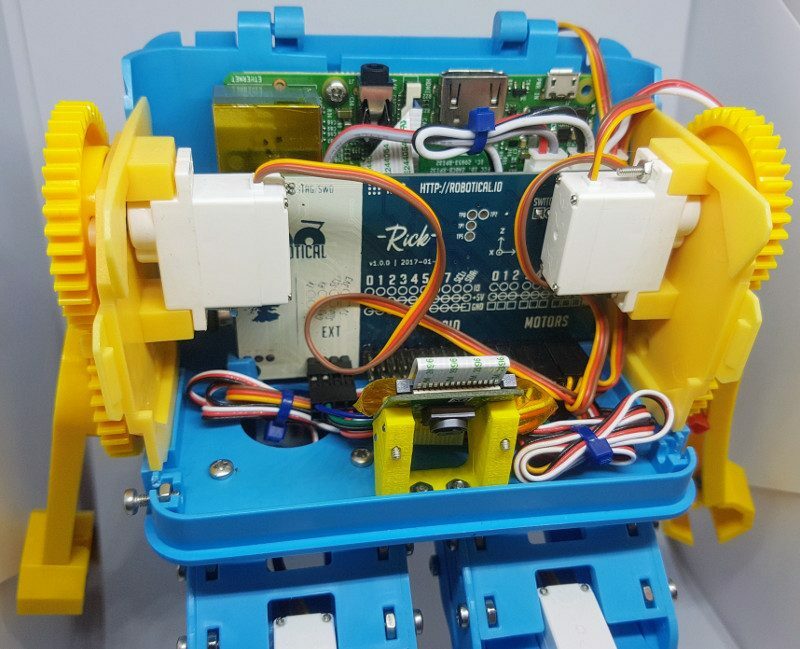 Note :- with the Raspberry Pi connected, it will take over control of Marty, so things which work using Marty's control board's inbuilt WiFi will no longer function. Be very careful with the Raspberry Pi camera cable, it's quite delicate. You don't need to run it under the control board like we (well, Angus) has here, although it is probably the neatest way to do it. When you turn on your Marty now, the Raspberry Pi will also boot up. After a minute or so you should see a "marty" wifi network apppear. Connect to that using the password "raspberry"
Open up a terminal by clicking on the icon. 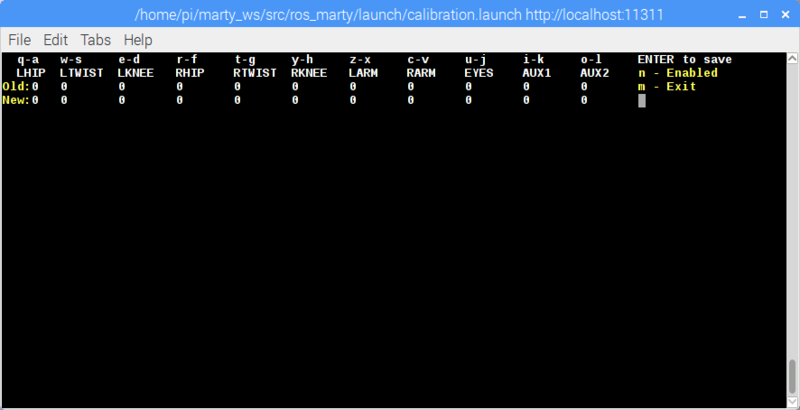 Then, type roslaunch ros_marty calibration.launch and press enter. This will bring up the Marty Raspberry Pi calibration script. This is just a sanity check that everything is where it should be. Press q to send a movement down, and then a to undo that. Marty should be standing straight. Press Enter and then y to save. Note - the calibration here is saved to the Raspberry Pi, not to our control board. So if something is amiss it's actually better to go and fix it using the normal calibration tool. We have this calibration step to let you use hardware other than our control board, so you shouldn't really need it if you are using our board. You do need to go through the step of saving calibration though, so the system knows it's safe to send movements. 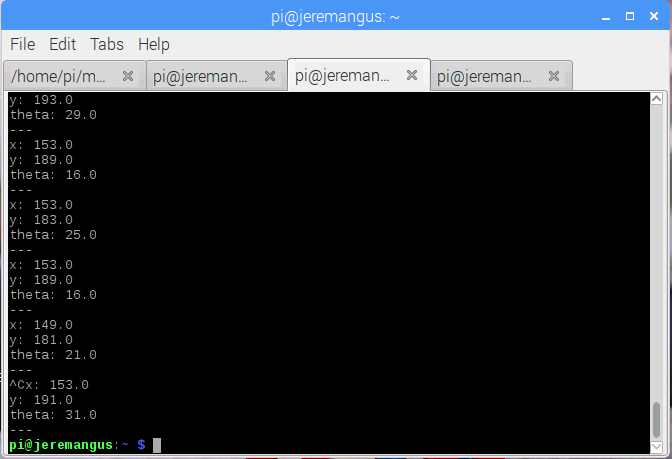 In the terminal, type sudo raspi-config and press enter. You'll see the Raspberry Pi configuration tool. Go into "5. Interfacing Options", then "Camera", and select "Yes" to enable the camera. Then select Finish. 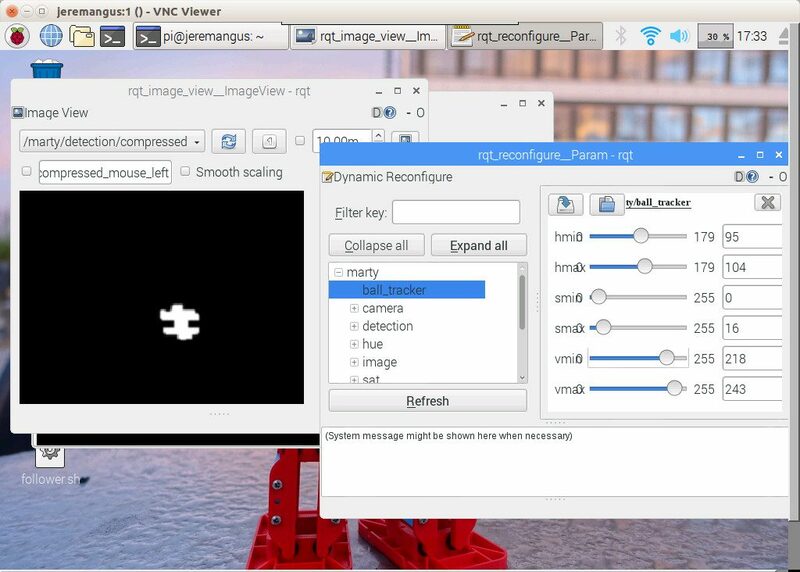 Once things are back online, Marty should do a little wiggle, and you should connect once more to the "marty" network, and restart VNC viewer. You won't need to run those setup steps again. So now on to the fun stuff! If you just wanna play around, there are some scripts on the desktop of our Raspberry Pi image which will start up a ball follower, and open the camera view, and configuration tool. And with that, if everything is connected right you'll see what Marty's camera can see! Start a new tab in the terminal (Ctrl-Shift-T, or use tmux if you know what you're doing!). Type roslaunch ball_following track_and_tag.launch and press enter. This will start up two things - ball tracking and April Tag detection. More on that second one in another post! You should see something like the above pic in your terminal. That shows that the tracker has loaded, along with tag detection. Alrighty, lets go back to the image viewer. Click the refresh button , and you should see a bunch more stuff appear in the dropdown list. After a few seconds a new window will pop up with the title rqt_reconfigure. In that window expand the menu that says marty, and click on the ball_tracker option. You'll see some sliders for parameters apppear on the right. These are for Hue, Saturation and Value, which the detector uses to try and identify the ball. 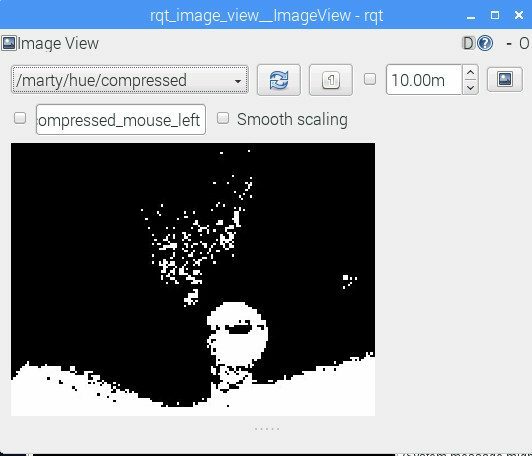 In the image viewer, select the /marty/hue/compressed topic, and the image will change to a black and white one. Okay - so the image viewer is now showing the output from the hue part of the ball detector. The white bits pass and the black bits don't. Ideally the only white shown should be where the ball is - but in practice that rarely happens, which is why we use multiple channels for detection. Now we want to adjust the hmin and hmax sliders in the rqt_reconfigure window to adjust the hue detection. hmax should always be greater than hmin. Try increasing hmax until the ball turns white in the image viewer, then increase hmin until most of the rest of the image turns black. Don't be too precise, or it won't cope well with lighting changes. It's a bit tricky to see, but the ball is mostly in white there. Excellent. Now we need to repeat that for saturation and value. Firstly select /marty/sat/compressed in the image viewer, and adjust the smin and smax sliders in rqt_reconfigure until the ball is mostly in white, and the rest of the image is mostly black. Again - don't be too precise with these adjustments, leave some wiggle room! Now, if we switch the viewer back to /marty/image/compressed, we should see that it is tracking the white ball! 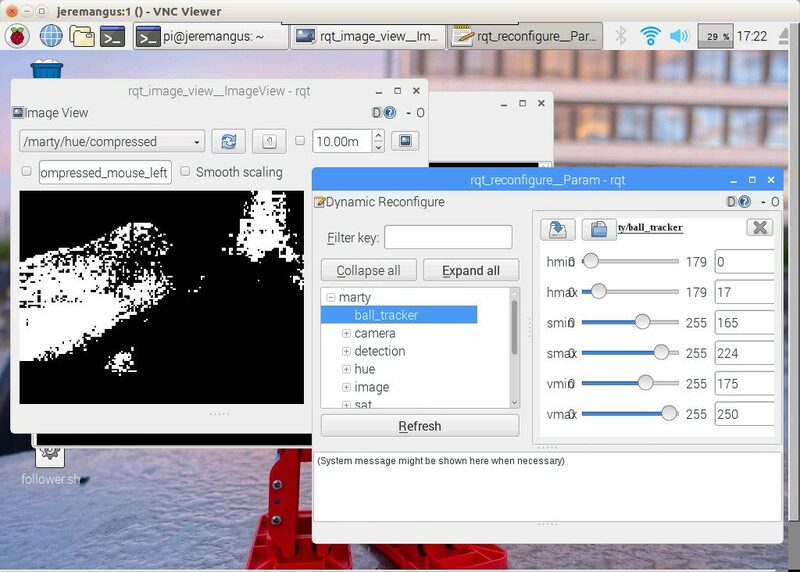 You can visually see what the ball detector is doing in the image viewer, but we're going to write code that wants to get the position of the ball in co-ordinates. You'll see a big list printed to the screen. Many of those should be familiar from the image viewer - the things we were viewing were topics which had an image type. But there are other topics too - you should see ones for the battery, accelerometer, servos, motor currents, and more. You should see numbers scrolling past showing the battery voltage. If you move the ball around when that's running, you should see the co-ordinates change. To see information on a topic, type rostopic info /marty/ball_pos. That'll show you that the type is geometry_msgs/Pose2D, and also show you the nodes that are publishing and subscribing to that topic. Publishing meaning writing data, and subscribing meanning reading data. As might be expected, the ball_tracker node, which we started when we ran the roslaunch command earlier, is publishing to the ball_pos topic. One of the nice things about ROS is that a topic can have multiple publishers and subscribers, which makes connecting bits of code together really nice. Here's where things get even more incredibly exciting. 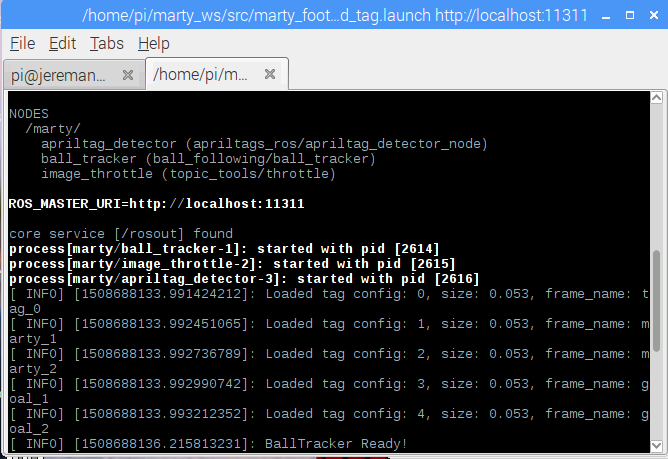 We're going to write a Python script which will take in the ball position data, and send commands to make Marty move! It'll be both a subscriber, because it will subscribe to the ball_pos topic, and a publisher, because it will publish to a topic that will send commands to Marty. The Raspberry Pi on Marty runs the ROS core - which is the bit of software that co-ordinates everything. There is a serial connection between the Raspberry Pi and Marty’s control board, and specific topics are sent over this link. This means that Marty’s control board is part of the ROS system on Marty, and can publish and subscribe to topics. We’ll be using the /marty/socket_cmd topic to send high level commands to Marty’s control board. By high level, we mean commands like “walk” and “kick”, rather than low level commands like specific joint angles. So what was that code doing? well, we were using the socket_cmd topic to send commands straight to Marty's control board. there are a lot of commands you can send, and the full documentation is available on the docs site. We published a specific series of bytes to that topic, and since the control board subscribes to that topic, it got the command and executed it. Is getting essential tools for this python script. We need rospy to do all the ros-ey things like publishing, we need struct to format the data properly for it to go over to the control board, and we need the ByteArray from marty_msgs.msg because that's the message type that the socket_cmd topic takes. These next three lines define a function to turn a human readable walk command into a series of bytes that the control board will understand. It's not essential to understand all the details of this, but if you have a look at the walk command in the socket api you can see a description of what bytes it expects - basically this code squeezes together the instruction code for walk, and all the parameters such as number of steps and step length, into a format that can be published on the socket_cmd topic. These lines of code will run until we stop the node. We use the walk_command function we defined earlier to create a command that will make marty take 1 step forwards, with no turn, an 1800ms step time, 40% step length, and choose which foot to use itself. The 2 as the foot is a code for that, as 0 and 1 can be used to specify which foot to take a step with. The rospy.loginfo line is used to print out information so we can see what's happening, in this case so we can see that command that's been constructed then we actually publish that command to the * marty socket_cmd* topic, so that the control board will get it and execute it. Let's run that script again, but now have a look at marty servo_positions while marty moves. The walk command is sent through the * marty socket_cmd topic down to Marty’s control board, which generates the walking movement and publishes the servo positions to the * marty servo_positions topic as marty moves. Ok, so we can track a ball, and command Marty to walk. With the power of ROS let's bring those two things together. This sets up the node to subscribe to the /marty/ball_pos topic. Whenever a message is published to that topic, the ball_CB function will be called. Ok, here's the actual logic for a very basic ball follower! If a ball is detected, the y coordinate (forward-backward) will be greater than zero, so first check means that this block of code will only run if a ball is detected. Next we generate the walk command, except this time using the turn and step_length that are conditional on the ball position. The rest is pretty much as before. You should find that Marty follows the ball! If you've managed to get this far, huge congratulations - you've made a walking robot detect and follow a ball! 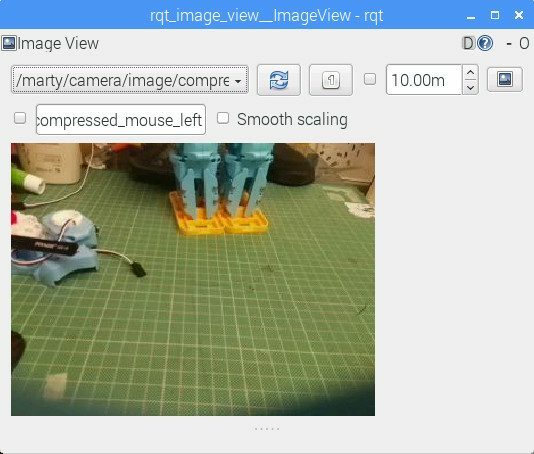 This is university level robotics stuff, and ROS is a real tool that's used on many academic and production robots. In future posts, we'll go into a bit more detail on how to use ROS, and we'll turn our simple ball follower into a script that can kick a ball, and eventually even line up to a goal before kicking it through! I've tested it with the B+ and the new A+, and both seem to work. Interestingly the A+ performs a bit better than I had expected. There are a few other updates in this image. 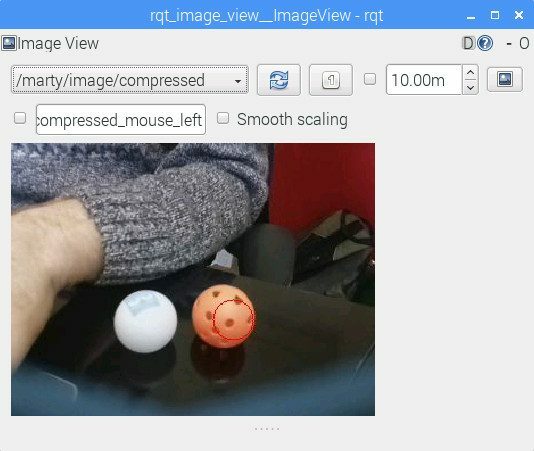 I took the opportunity to update to ROS kinetic, and the raspian release is fully up to date as well. The WiFi situation is also better managed, as I've used a script from Raspberry Connect to manage the hotspot/wifi generation. If you add your network info to /etc/wpa-supplicant it will try to connect, and then if that fails it'll generate a hotspot instead. Please let me know how you get on with it, any issues just let me know! which one is the correct image to use? 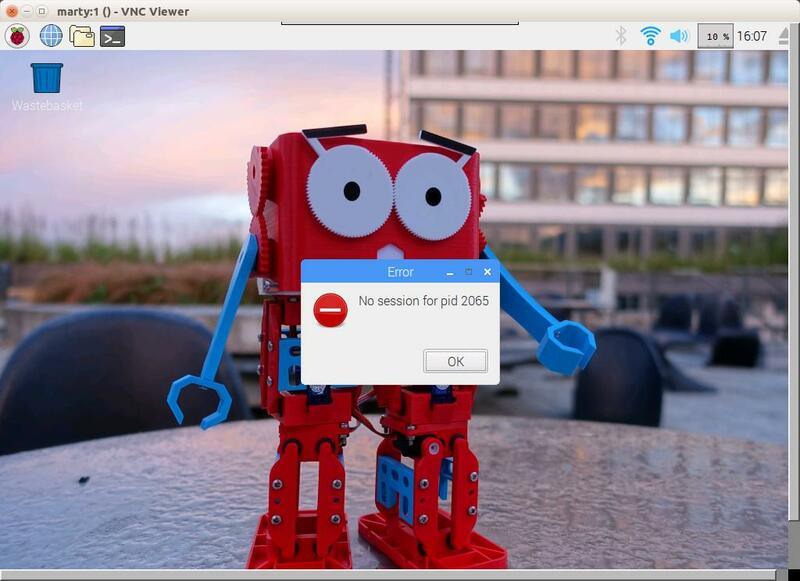 The link is broken (https://cdn.robotical.io/public/raspberry-pi-img/robotical-pi-latest.img.zip). I tried to use all the images here (https://public.robotical.io/index.html?prefix=raspberry-pi-img/) but none of them are working on my Pi3 B+. Are there any other images to use? Hi Sandy, this is an excellent post, with great content and well written, thank you. All the steps worked without any problems (I downloaded and used for the Raspberry Pi the latest image, and on my laptop I use the latest UBUNTU 17.10). Using VNC worked perfectly as documented in your text, except at one point where the command 'roslaunch ball_following track_and_tag.launch', where I kept getting 'roslaunch: Not Found'. After some intensive directory search, I found the required 'roslaunch' script in './ros_catkin_ws/src/ros_comm/roslaunch/scripts' directory, and successfully started the ball_following and tracking by specifying the full path to the script (there certainly is a simpler and more elegant way, something like including/defining the correct PATH so 'roslaunch' directory is accessible from 'home' - one of these days I will learn how to do that properly in Raspbean/Ubuntu/Linux...). Great - do let us know how you get on! You're correct on the Raspbery Pi pinout - it's connecting to the power and serial lines on the Pi. The cable will power the pi from the Rick, so you don't need to plug in the Pi's micro-USB power supply. Thank you. I will try a Pi3 first. 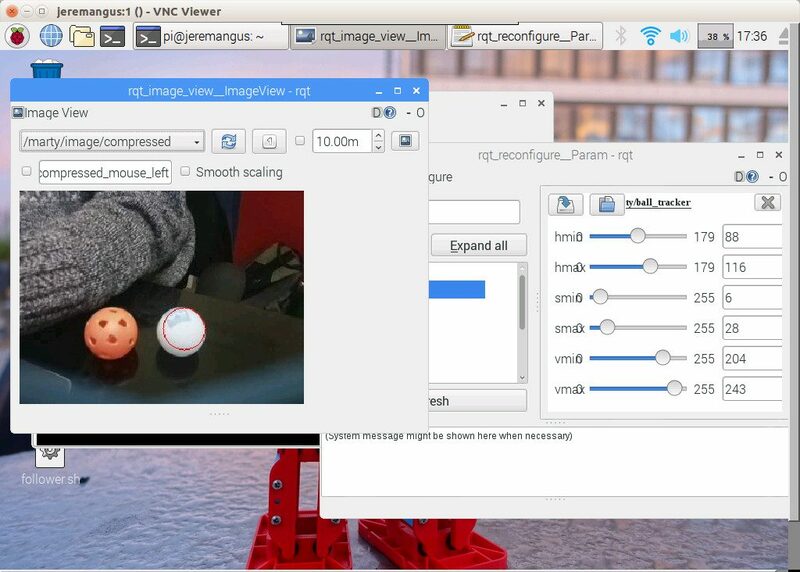 @richardjackson - if you're doing vision stuff the Pi3 will have a bit more oomph. I should also add that the above was done on a Pi3, I haven't tested the latest pi image on a zero W yet. I am planning to add a Raspberry Pi and camera to two Marty units. Should I use the Pi 3 instead of the Pi zero W, even though the Pi 3 uses more power and weighs a bit more? Do you have any recommendations/references to give about a good camera for that purpose? Do you sell the camera mounts or just provide the files for 3D printing? FYI - I've just worked through this (using the old pi image and updating the code using 'git pull origin dev' in the repos). All worked successfully - looking forward to the next steps (kicks? ).